There seems to be a belief that kids don’t like food with distinct flavours, that they won’t like this and they wouldn’t eat that, but I’m of the opinion that it’s usually well meaning adults making those decisions for their kids. My granddaughters have learned to enjoy a small amount of chilli in their food from eating Chinese, Thai and Vietnamese dishes with their parents however their resistance to Indian food lasted longer. They found it difficult differentiate between spice and chilli. Without a mention of “spice” or “India” I served this mild but aromatically spiced creamy chicken curry to them a while back, a small portion to try with carrot and cashew nut pilau, cucumber raita and some simple steamed broccolini. They were both came back for seconds in a flash, and if it wasn’t for good manners, I think they’d have licked their plates clean. There is no chilli at all in this curry, but there is a large amount of whole and ground spices. The flavour IS spicy, but in a rich and aromatic way that lingers because there’s no chilli to cut it short. This delicious curry is an adaptation of Murgh Masala from The Food of India, a Murdoch publication. In a heavy based pan, heat then oil over a medium heat then toast the whole spices and curry leaves. When the seeds begin to splutter, add the chicken, ground spices, ginger and tomatoes. Stir the thoroughly distribute the spices through the chicken the stir in the yoghurt and salt. Slowly bring the pan to the boil, stir well then cover and simmer over a low heat for 30 minutes. Uncover and continue to simmer for a further 15 minutes. What a fantastic recipe! I’m making it this week. And I love that you’ve used chicken thighs, which is the cut I always use for my curries. Variety is the spice of life, keeps mealtime exciting.. I suffer prop envy each time I read your Indian posts Sandra. Thanks Conor, I recall seeing a gorgeous timber board in a photo you posted and having a similar response.. Even me, a chilli addict, can see whats in your masala, and know I would love it. Its a yes, to feeding kids a variety cuisines, but my daughter (23yrs) was used to Indian food been eaten by her parents & friends a couple of times weekly, and at social gatherings. She now cooks up ‘curry’ a couple of times a week – whilst there are no children yet, I do see a pattern. Kids in India are weaned on spicy food so it seems we in the west are misguided. This is a really aromatic curry but adding chilli would be perfectly acceptable! Sounds delicious. And yes I agree kids should at least try these things. I can think of a good few adults who’d like this, including a chilli-hating friend. I’ll bet your kitchen smelled wonderful, so aromatic. Yes,my husband has been training me for 20 years! * big smile whilst remembering* When our two daughters began eating dinner with us initially I actually cooked half the dinner more simply for them! No way were they willing to be ‘babies’!! ‘We want what you are having’ was the catchcry – and they were both stubborn enough not to show if they did not like something we enjoyed!! And that included SO much Indian food, pretty hot at that 🙂 !! Travel with them was a true joy: they were much bolder in asking the waiter to describe a dish 🙂 !! 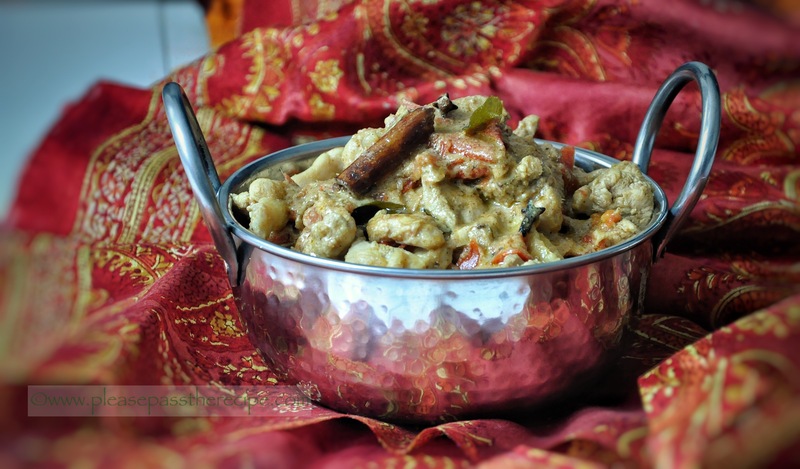 Yours is a classic and beautiful chicken curry [must add curry leaves to my recipe!] sans the chilli component . . . . shall try it when a few of my less heat loving friends come for dinner . . .
There’s a lot to be said for not creating preconceptions! Being adventurous with food will serve them well in the future 🙂 And this sounds delish. I agree; I think the French have the right idea. They don’t have special food for children, they feed them what the adults are having, and the children develop much more sophisticated palates as a result! From an early age, my son enjoyed spicy foods – particularly TexMex and Indian. Children should be able to explore foods and be given a wide variety of tastes, but you are right that too much chilli can sometimes put people off. I’m sure your grandchildren enjoyed this curry! This entry was posted on April 27, 2017 by ladyredspecs in Chicken dishes, Cooking, FODMAP diet, Food, Gluten Free, Indian Food, Light Savoury Dishes, Main Meals, recipes and tagged chicken, chicken masala, Fodmap, gluten free, mild chicken curry.